On Miracles and Facing The Unknown . . . .
to remember them as we face the unknown. “Let the hearts of those who seek the Lord rejoice. 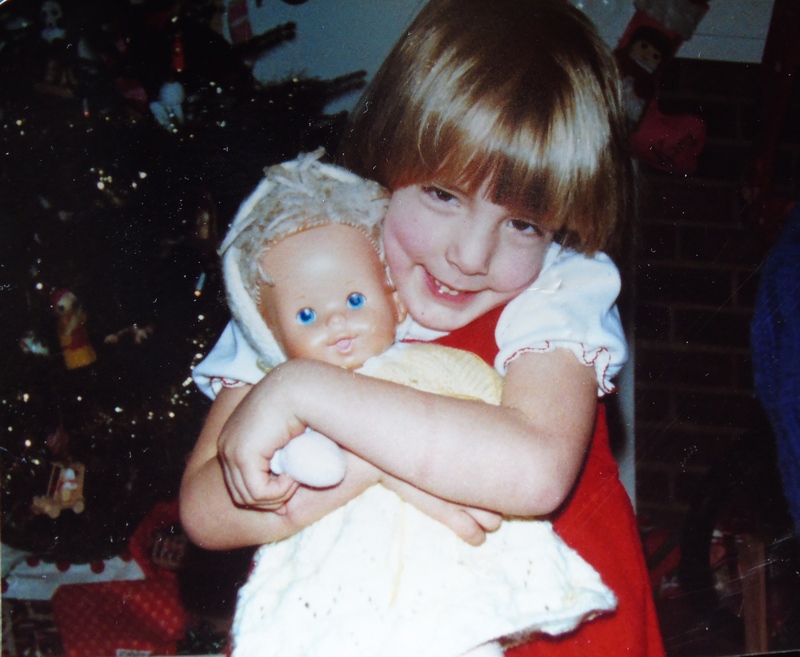 Amy and her much-loved doll, Ka’wen. Stunned yet not wanting to upset her, I immediately forgot my project to give her my full attention. I could see the gum lodged in her nostril but could not quite reach it. Trying to stay calm, I instructed Amy to: (1) open her mouth to take a deep breath of air in, and then (2) told her to close her mouth as she blew the air (and hopefully the gum) out her nose. Of course, that is not at all what happened. Amy took a huge breath in through her nose and sucked the gum far up into her sinus cavity! I called the Advice Nurse and was instructed to immediately bring her in to remove the gum. As the four technicians held Amy’s legs, shoulders and hands, she became transfixed on the doctor and the light on his head. Her body did not tense, in fact, she appeared quite relaxed as the doctor positioned the long tweezers above her. As I watched the tweezers enter her nostril, Amy appeared to be fascinated by what the doctor was doing and NEVER FLINCHED–TRULY! After the doctor had removed the gum turned off his light, he turned to me looking totally astonished as he said, “I have never had a child stay still like that for such a procedure–NEVER!” The technicians appeared equally impressed as they pulled out a bunch of stickers to commend Amy’s bravery. It was truly miraculous! More than three decades later, it still gives me pleasure to think about that day. I never have entirely figured out what caused Amy to remain so still, but I do remember that she seemed transfixed as the doctor spoke softly and she focused on the light that shone brightly above her. What I DO know was that something special happened in those moments when Amy steadfastly refused to give way to fear. What can we learn from this, especially when we face the unknown? For me, the lesson is about choices–in every season we come to in life there are choices to be made. Do we give way to fear, anger or some other emotion that can so easily overwhelm us? Or, do we take that deep breath of faith, steadfastly looking to the Light of Christ to help us in our time of need? After all is said and done, isn’t that what it is all about? We serve a God of Miracles, tried and true! ‹ PreviousHow to Make Joy in Your Journey a Reality . . . .
Next ›“Lord, Turn Our Whining Into Worship”– The Necessity Of Spiritual Regrouping* . . . .
Ohhhh, I winced and laughed and loved this post. PS….What mom hasn’t had her kid stuff something somewhere in their body. My son stuffed a plastic candy wrapper in his ear. We thought it was butterfly wings till the doctor removed it. Oh, the joys of being a mom and connecting precious moments to our heavenly Father’s love for His children. Kathie, my daughter Amber did the same things, but she used play dough. I held one nostril, and told her to take a breath and blow. I’m thankful it worked for us. She was also 3 years old. Thanks for sharing!!! LOVED the story and more so the lesson you taught my heart. THANK YOU, dear Kathie! Kathy, Thank you for sharing. I have not forgot about our counseling. Life has just got in the way with therapy 3x week, helping our new neighbor, rescuing cats and kittens in Wild Meadows, our new kitten, incompatible laptop and printer, broken spring a garage door, funerals, caring for the grands, folks celebrating my birthday, etc. I have read I Timothy several times, but my comprehension stinks. Anyway, the next two weeks are rough since I will be caring for my 88 yr old Donie when she returns fron Milford Rehab on Thursday and then we go to PA the first week in March to care for our 19 mos old Avery. Her other grandmother, who is her every day caregiver, will be on vacation with her other newborn grandson, Campbell, in Puerto Rico! Kathy, never a dull moment here. My prayer in the meantime is for God to remove the negativity of Tabber and Michele from my heart and just to love them and bring them back into His fold❣ Saw Marshall last Sunday, but not you. I remember that! I got this cool monkey toy in addition to the stickers! It’s also a miracle that you survived some of the other doctor visits where I was horrendously non-compliant!